Today, our Portfolio Line of Credit, which gives clients fast and easy access to cash for up to 30% of the value of their taxable investment account, is now available to all Wealthfront clients with a taxable account of $25,000 or more. Clients have flooded us with positive feedback about this feature, which until now, has only been available to those who have invested $100,000 or more. So we did what we always do when you tell us you like something: We found a way to make it available to even more people. So how does this work? Here’s the rundown. Our Portfolio Line of Credit is designed to be effortless. There’s no application, no credit check, no obnoxious paperwork. A few clicks and you’re done. You’ve spent longer looking up your bank’s routing number. And once the ball is rolling, your money gets to you quickly, usually in 1-3 business days. And the interest rate? Folks, it’s good. Because your line of credit is secured by your investments, we’re able to keep the interest rate nice and low (currently 4.75% – 6.00% depending on account size). Compare that to credit cards and home equity lines of credit, which require a merciless amount of paperwork, take weeks (aka, forever) to get your money, and carry higher interest rates. A line of credit that keeps your money hard at work. By accessing your Wealthfront Portfolio Line of Credit, you don’t disrupt your investments when you need cash for a near-term expense. Not only does this keep your investments working for your future while you handle your present, but you also avoid the tax hit associated with selling investments. Think of it as a fast back-up plan with the fewest possible downsides. Don’t let this year’s tax bill derail your long-term investments. We like to think there’s no problem we can’t solve, but alas, we can’t stop tax season from coming. 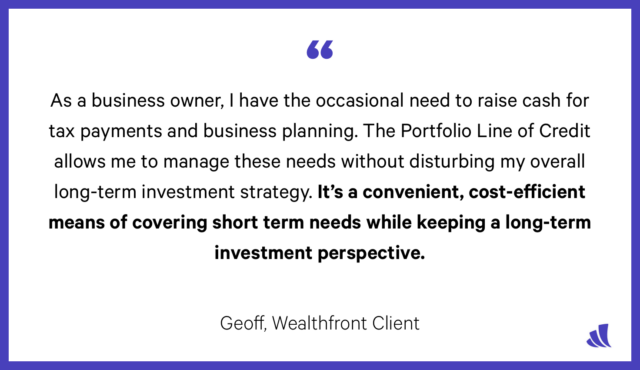 What we can do is arm Wealthfront clients with products that make financial planning and maneuvering as painless as possible — and that includes enduring a tax season full of changes that might have you facing a more daunting tax bill than in years past. 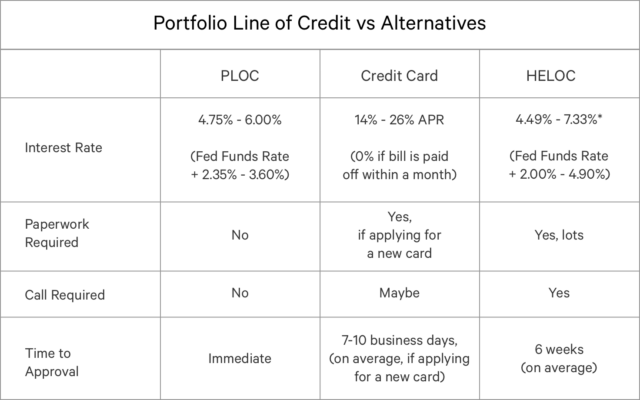 The Portfolio Line of Credit can quickly give you the liquidity you need to take on your taxes without your investments and goals taking the hit. Managing an unruly tax bill without knocking your financial plans off the rails is far from the only use for a Portfolio Line of Credit (and probably the least fun, to be honest). This is an effortless option when you need some quick cash to cover a bill (credit card, tuition, medical expenses) or to kick off a large purchase, like a new car or home renovation. Want to invest in your friend’s new venture or get your own startup off the ground? Wealthfront’s Portfolio Line of Credit is a fast and easy way to inject cash where you need it, no hoops to jump through — and you can pay it back on your own timeline. The interest accrues until you’re ready to pay back the loan, so you don’t even need to make monthly payments. Making good things and then making them better. Our target is to create an integrated, personalized money ecosystem that empowers you to see the full scope of your financial life and gives you the agility you need to reach your goals at the right time — without having to open a dozen apps and log in to multiple sites. And tailored financial advice along the way will make sure you’re optimizing every opportunity, according to the priorities you set. Investment advisory services are provided by Wealthfront Advisers LLC, an SEC-registered investment adviser, and brokerage products and services, including the Portfolio Line of Credit (PLOC), are provided by Wealthfront Brokerage LLC, member FINRA / SIPC. Nothing in this communication should be construed as an offer, recommendation, or solicitation to buy or sell any security. Past results do not guarantee of future results. Wealthfront Brokerage LLC and its affiliates do not provide legal or tax advice and do not assume any liability for the tax consequences of any client transaction. Investors are encouraged to consult with their personal legal and tax advisors. The testimonials provided above by the PLOC client may not be representative of the experience of other clients, and there is no guarantee that all PLOC clients will have similar experiences. Wealthfront Brokerage LLC and Wealthfront Advisers LLC are wholly-owned subsidiaries of Wealthfront Corporation.